In the late stages of the Civil War the Union forces were intent on moving up the rail line from New Bern through Kinston to Goldsboro. Their objective was to unite with Sherman and open a supply route through eastern North Carolina. Confederate troops entrenched on Southwest Creek sought to impede their progress. For three days the opposing armies clashed in the fields and woods south and east of the creek. Union Maj. Gen. Jacob D. Cox commanded over 13,000 soldiers, most belonging to the divisions of Brig. Gen. Innis N. Palmer and Brig. Gen. Samuel P. Carter. Gen. Braxton Bragg led a Confederate force of 12,500 men, organized in divisions led by fellow North Carolinians Gen. Robert F. Hoke and Gen. D. H. Hill. The Junior Reserves, mostly seventeen-year-olds mustered in only months before, came under Hill’s command. 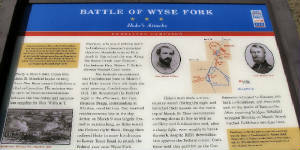 By March 6, Union troops were gathered in Gum Swamp three miles east of Wyse Fork. Travel, along the bed of the Atlantic and North Carolina Railroad and through swampy terrain, was difficult, made more so by heavy rains and a lack of wagons. Meanwhile Gen. Bragg had moved his army up from the lower Cape Fear region. 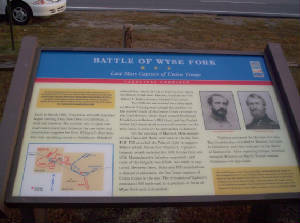 On the evening of March 7, advance Union guards skirmished with Confederates at Wyse Fork as Palmer’s division moved into position 800 yards east of the creek. Friday, March 8, was the high point for the Confederates. In mid-morning Hoke’s division moved down Upper Trent Road and around the head of the millpond. With whoops and yells, they “burst through like a torrent,” striking the Federals’ left flank. Concurrent with Hoke’s move, Hill’s division crossed the creek and struck the right flank. The 15th Connecticut, positioned south of Dover Road and 500 yards east of Jackson’s Mill, was besieged. Col. Charles L. Upham’s brigade shattered, with 890 men taken prisoner and horses and guns abandoned. By the end of the day Confederates, with the support of artillery fire, occupied a line along British Road. That evening a division led by Brig. Gen. Thomas H. Ruger arrived to offer additional Federal support. On Gen. Cox’s orders, Union forces hastily threw up a continuous line of breastworks on both sides of Lower Trent Road. Short of supplies they used boards as shovels. Confederates on March 9 tested the Union’s right flank by conducting a reconnaissance survey down the Neuse Road. Artillery exchanges continued through the night of March 9. At 11:30 AM on March 10, a “vigorous assault” was made on the extreme left of the Union line. An hour later the Confederates left the field, soon thereafter returning to attack the center. Union positions were tested and driven in, but held. The 66th NC Regiment, organized in Kinston, came within 50 yards of the Federal works, withstanding a “galling fire.” At 2:30 PM the Confederates made their final charge and Union skirmishers fell back to their main rifle pits. With nightfall Gen. Bragg’s troops withdrew from their trenches and retired to Kinston. With the exit of Bragg’s force, the crew of the ironclad Neuse burned and sank their ship. 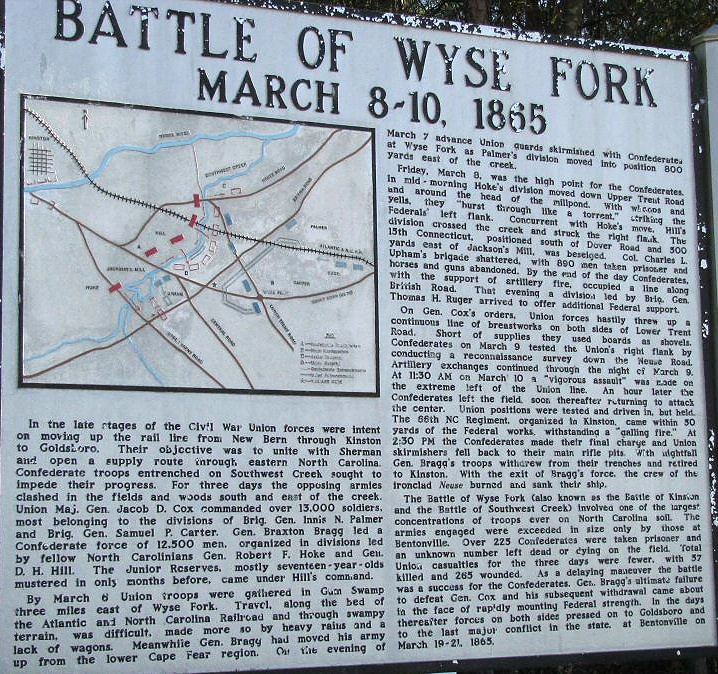 The Battle of Wyse Fork (also known as the 2nd Battle of Kinston and the Battle of Southwest Creek) involved one of the largest concentrations of troops ever on North Carolina soil. The armies engaged were exceeded in size only by those at Bentonville. Over 225 Confederates were taken prisoner and an unknown number left dead or dying on the field. Total Union casualties for the three days were fewer, with 57 killed and 265 wounded. As a delaying maneuver the battle was a success for the Confederates. 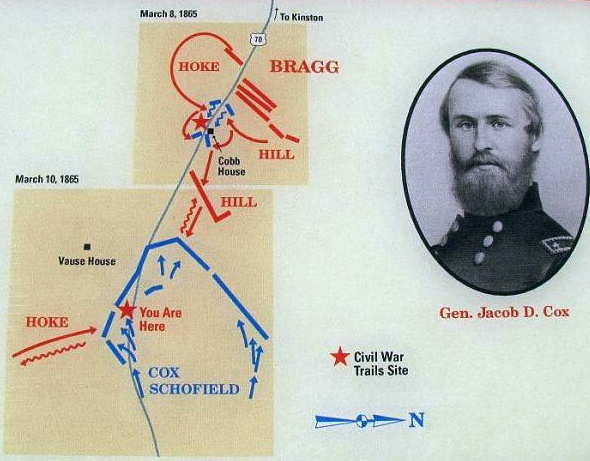 Gen. Bragg’s ultimate failure to defeat Gen. Cox and his subsequent withdrawal came about in the face of rapidly mounting Federal strength. In the days thereafter forces on both sides pressed on to Goldsboro and to the last major conflict in the state, at Bentonville on March 19-21, 1865. References: Andrea Lee Novick, National Register of Historic Places nomination (2005); Official Records of the War of the Rebellion, XLVII, pt. 1, pp. 973-1001; Atlas to Accompany the Official Records of the Union and Confederate Armies; Walter Clark, ed., Histories of the Several Regiments and Battalions from North Carolina (1901); Sheldon B. Thorpe, The History of the Fifteenth Connecticut Volunteers (1893); Johnson Hagood, Memoirs of the War of Secession (1910); John G. Barrett, Civil War in North Carolina (1963).